Glasses Made On The Spot! Every day the Eye Care Charity of Mid America’s Mobile Vision Clinic (MVC) visits schools to perform eye exams and provide glasses to low-income children in our community. The MVC is fitted with two exam lanes so we can provide free eye care for up to 50 children in one visit. Also located on board is a finishing lab where glasses are made on the spot. Once aboard, a child completes a pre-test and eye exam. From there, he or she chooses a designer frame, generously donated by VSP Global, Europa, and Modern Optical. Once a frame is selected our Director of Operations carefully measures, cuts and assembles each new pair of glasses on site in a six step process outlined below. The Frame Tracer does just that – traces the frames. The plastic lenses are popped out and the frames are placed on the tracer. A needle runs along the inside of the frame to capture the lens shape and size. The data collected is automatically shared with the other machines in the process. We keep lenses organized by prescription in the lab for quick and easy selection. 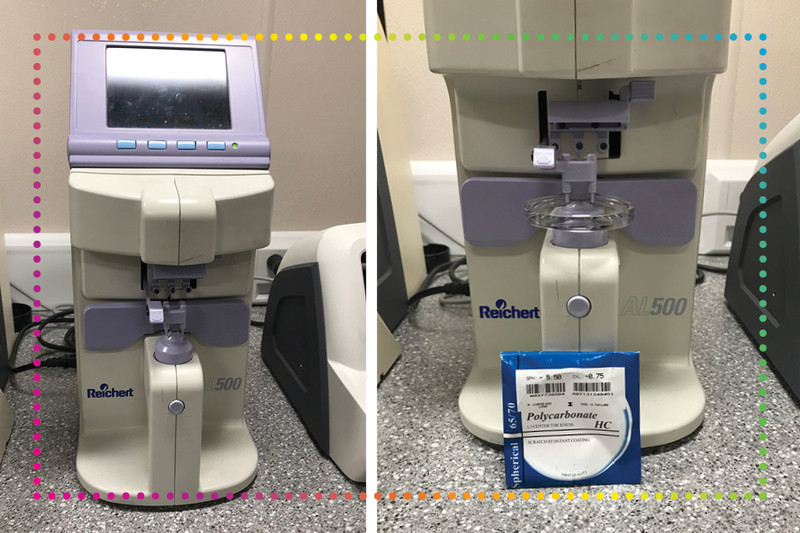 Lenses are mounted, one at a time, into the auto lensometer which reads the prescription, orients the Rx axis, and marks the optical center of the uncut lenses, preparing them for the lens blocker. Lenses are then placed one at a time in the lens blocker which ensures the edger cuts the correct lens over the optical center and affixes a block to the lens so it can be held in place throughout the edging process. Once the blocker is in place, the lenses are placed, one at a time, in the edger which cuts the lens to fit the measurements of the frame as collected by the frame tracer. This process takes about one to two minutes per lens, depending on the prescription and thickness of the lens. After both lenses are properly edged, they are placed in the frames and cleaned. From start to finish, this entire process can take anywhere from five to seven minutes per pair of glasses. The best part of the process! The child receives his or her new pair of glasses (printed Rx, new case, and cleaning cloth) and returns to the classroom ready to thrive. Children are active. They run, jump, climb, fall, and sometimes break things. This is why Eye Care Charity of Mid-America takes time to teach every child how to care for their new prescription eyeglasses on board our Mobile Vision Clinic. Read on for easy tips to help any child wear and take care of their glasses. Children will obviously be much more likely to take care of their glasses if they like them. Children who receive prescriptions on board our Mobile Vision Clinic get to select a frame of their choice. ECCOMA has a selection of over 200 designer frames to ensure that every child picks out the pair that is perfect them! Show your child how to use both hands to remove their glasses. Have them grip both side arms and pull eyeglass frames straight off of their face, rather than using only one hand. This will prevent any uneven wear and keep glasses fitting properly. It’s important to teach your child how to clean their glasses. They should begin by running their lenses under warm water. Then dry the lenses using the ECCOMA cleaning cloth that was provided to your child. This is a special, soft, lift-free cloth that is perfect for cleaning lenses. Remind your child to keep their glasses in the case provided by ECCOMA whenever they are not in use. This is very important so the lenses won't get scratched and dirty. It is also a great idea to include their name and phone number inside the case so they can be returned if they are ever lost. By teaching kids these basic tips, taking care of their new prescription glasses will become second nature. While we emphasize the importance of taking good care of their glasses, kids will be kids – and accidents happen. Children with special needs or very high prescriptions are given two pairs (so that one can stay at school and always be at-the-ready when it’s time to learn). And any child who breaks their glasses gets a free replacement in the mail within one to two weeks – no questions asked! I Can Really See You! Eye Care Charity of Mid-America (ECCOMA) is dedicated to ensuring that no child in our community fails to thrive simply because their family cannot afford glasses. Every day, our Mobile Vision Clinic (MVC) brings free eye exams and glasses to children at school – removing the barriers of access and expense that stand between too many low-income children and a bright future. Laura Holba is a nurse in the Hazelwood School District. She schedules the MVC to visit her school at least twice a year, because the need is so great. This past year, Holba screened a kindergartener, “Logan,” who failed the in-school vision screening and was referred to ECCOMA for a comprehensive vision exam. Because Logan’s prescription was substantial, his glasses were made in a lab and sent to his school. Logan turned to his best friend, whose face he had never seen clearly, and said, “I can see you! I can really see you!” Logan was thrilled with his new ability to see clearly for the first time. When a person’s eyesight is particularly poor, the person cannot differentiate details such as facial features. Logan did not know what his best friend looked like. Imagine the feeling of discovering for the first time what people’s faces really look like. In addition to helping their child see clearly, parents love the convenience offered by ECCOMA. Since the exams take place at school they don’t have to worry about taking time off from work to take their children to the optometrist. They also don’t have to worry about how to fit the expense into their budget, since the exam and glasses are provided for free. Research has shown that children with uncorrected vision conditions or eye health problems face many barriers in life. Studies converge on three key areas where impaired vision impacts children: life-long health, school performance, and emotional/social development. High-quality eye care can break down these barriers and help enable children to reach their highest potential.